Why Do People Refer to a Non-Existent 'Nuclear Button'? In his Tuesday address at the United Nations General Assembly, US President Donald Trump threatened to “totally destroy North Korea” if the US is forced to defend itself or its allies. Over the past month, North Korea conducted its largest nuclear test and fired its longest-traveling missile. Michael R. Auslin is a research fellow in contemporary Asia at the Hoover Institution at Stanford University, who specializes in global risk analysis, US security and foreign policy strategy, and security and political relations in Asia. Gi-Wook Shin is a professor of sociology, a senior fellow at the Freeman Spogli Institute for International Studies, and director of the Shorenstein Asia-Pacific Research Center. The two scholars recently talked about the escalating situation between the two countries and what real options the two leaders have on the table. 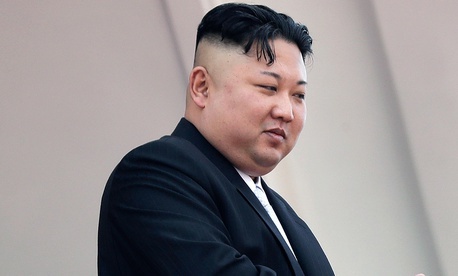 Q: Since North Korea conducted its first nuclear test in 2006, the United Nations and individual countries, including the US, have imposed several sanctions on the country. Despite those efforts to pressure North Korea to denuclearize, the country’s nuclear capabilities have steadily increased. Why do you think these previous efforts did not work? Auslin: North Korea has been intent on getting a nuclear weapon for decades, so the basic premise that Pyongyang would bargain away its program was likely faulty. Serious, comprehensive sanctions were never tried, in part because of Chinese and Russian opposition. By effectively taking the threat of the use of force off the table, previous administrations gave Pyongyang no incentive to take negotiations seriously. Previous North Korean undermining of agreements resulted in no serious cost and instead spurred Washington and its allies to offer further negotiations. Shin: I think that the main obstacles to the previous efforts to pressure North Korea were China and Russia’s partial support for, and not-so-full implementation of, the sanctions. For instance, despite Beijing’s announcement that it would uphold the sanctions, border trade and economic activities between China and North Korea continued, and Beijing knowingly allowed this to happen. Additionally, North Korea is so used to living under difficult economic circumstances that it has found ways to be less affected by sanctions, learning how to get around sanctions—e.g., through smuggling—instead. Q: What does North Korea hope to gain by amassing a nuclear arsenal? Auslin: North Korea has wanted to prevent the possibility of any foreign attack and a nuclear capability is the best means of achieving that goal. It also seeks to use any means to intimidate its neighbors and prevent them from undertaking any anti-North Korean action. It also may hope to end its international isolation by fielding a nuclear arsenal so that it can no longer be “ignored” by the international community. Shin: By amassing a nuclear arsenal, North Korea hopes to secure the Kim regime internally and externally. Nuclear development is a main pillar of Kim’s byeongjin policy, a policy of simultaneous development of nuclear weapons and the economy. Once North Korea obtains nuclear state status, it will try to negotiate with the US and South Korea for what it really wants. This could be economic support, international recognition, a peace treaty with the US, etc. Q: Are there still diplomatic means of addressing this situation that have not been explored? What are they and what is the likelihood they would be effective? Shin: I am a believer in diplomatic power and continue to think that we shouldn’t give up on diplomacy, but it’s true that all previous diplomatic efforts with North Korea have failed, and it is questionable whether any diplomatic approach will be effective at this point. But one possible—perhaps final—approach that has not yet been explored is a Trump-Kim summit at which the two leaders might make a “big deal”—that is, to get North Korea to denuclearize in exchange for a normalization of their relationship, i.e., a peace treaty, between North Korea and the US But this would be an extremely difficult thing to pull off, both politically and diplomatically. Auslin: No package of incentives has been effective for the past quarter-century, and both bilateral and multilateral negotiations have failed. There is little reason to believe that there are untried diplomatic means that can make a breakthrough where so many have failed. Q: Can a diplomatic solution be reached without the cooperation of China? Shin: China has always advocated diplomacy with North Korea, and I believe that China’s cooperation is essential, but I would also caution against relying or counting on China too heavily. From China’s perspective, the main reason for North Korea’s nuclearization has to do with the American threat—perceived or real—to its national security. Auslin: China has shown little appetite for constructively solving the North Korean crisis through diplomatic means. Moreover, it is unclear that China retains significant political influence in Kim Jong-un’s era, even given the importance of Chinese trade with North Korea. However, if Washington and Beijing decided that a more coercive approach was necessary, then China would have a major role to play. Q: What are the military options on the table for the US? Auslin: Very few, short of all-out war. The North Korean nuclear program is too advanced and dispersed to be taken out by pinpoint bombing, and its missiles are on road-mobile launchers when not hidden, making them difficult to track and destroy. Seoul remains at risk from thousands of conventional artillery launchers that would certainly be used in the event of an American strike inside North Korea. Shin: There are a number of possibilities, including a surgical strike, but given that North Korea would most likely retaliate by attacking South Korea—an action that would lead to the deaths of hundreds of thousands of South Korean citizens, plus a good number of US soldiers and citizens in the country—it’s not a tempting option. The US government and its military are well aware that any military action would be very dangerous. Q: What potential actions could lead to even more destabilization and should be avoided? Shin: Any major military action should be avoided, as it would put both South Korea and possibly the US at great risk. Given that North Korea will continue its efforts to become a nuclear state, and given that military options are not viable, we may have to find a way to live with a nuclear North Korea. It is a reality that we have worked hard to avoid, but time is not on our side. I hear more and more South Koreans calling for South Korea to go nuclear now and a similar movement could begin in Japan. This would mean that the region is entering into a very unfortunate and dangerous situation.